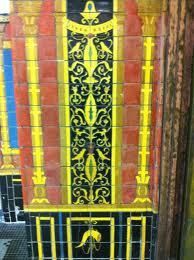 Architecture came first. I’ve known I wanted to be an architect since I was in the ninth grade. I got into competitive swimming a couple of years later, and only by accident. I mean that literally. I was 16, and four days after I’d just bought my first car, I was driving onto a freeway onramp when one of the tires blew out. If I had been an older, more experienced driver, maybe things could have gone better, but as it was, the car rolled. It was a convertible, and I wasn’t wearing a seatbelt. Luckily no one else was involved, but I was in a wheelchair for weeks, then had to walk with a cane for a while. Before that, I’d been a serious runner and had already finished two half-marathons, but permanent injuries to my right calf put an end to that. So I turned to swimming, first as physical therapy. Then I started swimming competitively for the high school team. I swam about 6,000 yards a day and participated in meets on the weekends. I joined the swim team in college; by the end of my first year, I was trying to juggle swimming, work, and architecture studio. It was the swim coach who told me I would have to choose between competitive swimming and architecture even though he knew the outcome. So I stopped competing. Later, when I moved to Milwaukee to work for an architecture firm, I joined the Masters team in Brown Deer and met my future wife. Ironically enough, she had grown up in San Francisco and I’d grown up in Chico, but it took Milwaukee to bring us together. We moved back to the Bay Area a little over a decade ago. With two children now, I swim two to three times a week, if I’m lucky. I’ve been swimming with the Masters team at Koret Health and Recreation Center for about two years. I do my clearest thinking when I’m swimming. It makes me a better thinker. And it makes me a better pool architect. 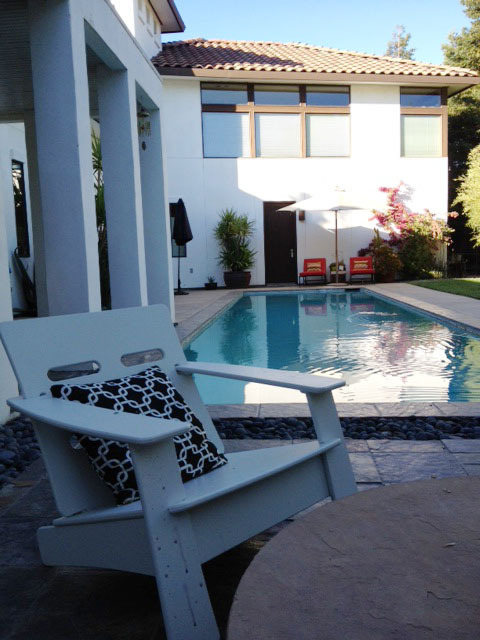 The first swimming pool project I worked on was while designing my brother’s house in Elk Grove, California. Since I had grown up in the Central Valley, I knew that the summers were very hot and that a pool can add a cooling element to the house. The basic design of the house is a courtyard scheme cut in half, with the pool in the courtyard. At one end of the pool is an outdoor fireplace, and along one side is a portico with an outdoor eating area. This outdoor room has become a true extension to the house and a favorite place to hang out during parties. 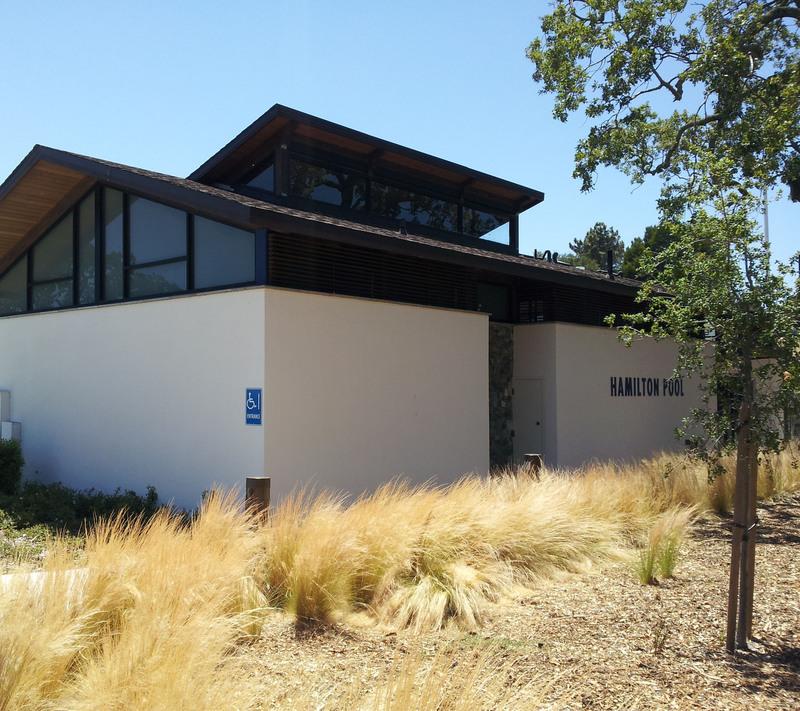 The first lap pool project I worked on, when I was with Field Paoli, was the renovation of Hamilton Pool in Novato. When our clients asked me questions from the user standpoint, I realized I’ve been pretty much every kind of user—the serious swimmer, the parent with young kids, the guy who needs to swim as physical therapy. I understood where parents of little kids might want to pull up a chaise so they could still have a good sightline to the pool, and where they might want to sit if their kids were older. 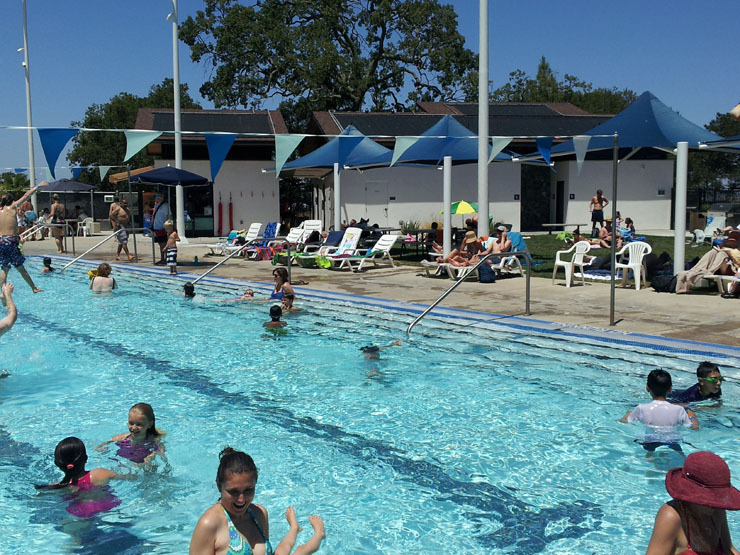 Most public swim centers don’t break even—in fact, they generally operate at a loss. But how well the facility is designed and tailored to its community can make a huge difference. A lot of it comes down to offering what the community wants—in the case of the pool we were working on, the community wanted a recreation pool where parents could easily keep an eye on their kids and where everyone could take swim lessons or just have fun. They also wanted a comfortable environment for hanging out, barbecuing, and enjoying views of the bay. Some sort of water slide is always big draw. Birthday party rooms generate a lot of revenue, which helps subsidize other amenities. 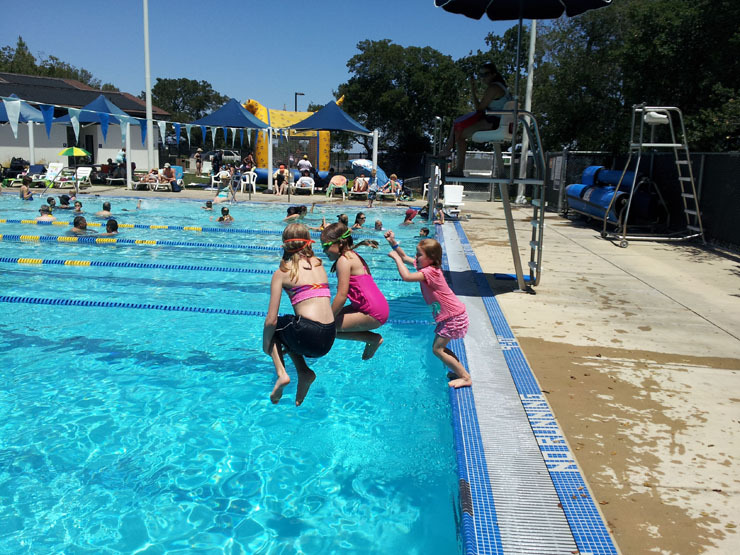 Swim classes may not bring in as much money, but they do attract people who come back to use the pool for recreation. After it reopened, Hamilton Pool brought its annual operating loss down to less than 3 percent of the pre-renovation figure. Unfortunately for me, accommodating the needs of competitive swimmers in public swim facilities is a challenge, and not many communities are able to afford a separate competitive pool. When you run the numbers, a competition pool doesn’t recover operating costs as well as a recreation pool. Sometimes communities try to split the difference with a pool for both kinds of swimmers. But recreational swimmers generally prefer water around 82 to 85 degrees, while competitive swimmers need 79 to 81 degrees, because if you’re swimming hard for an hour, you’ll overheat if the water’s too warm. Recreational pools also often have smaller lanes, which can drive competitive swimmers crazy. 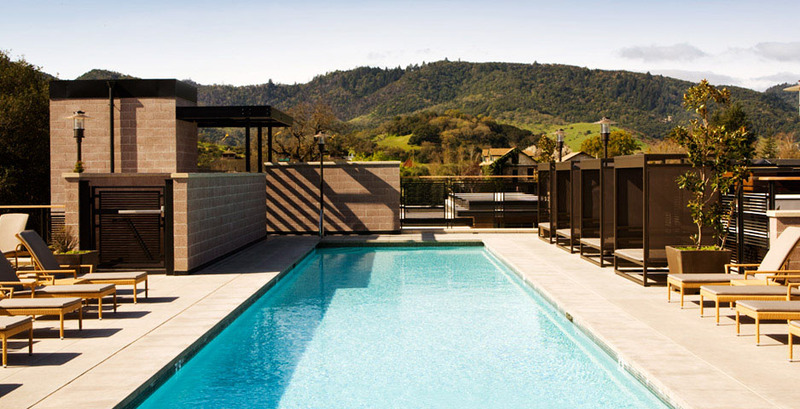 Some of my favorite pools are the one at the West Side Y in New York City, which has gorgeous tiles; the pool at the Bardessono hotel in Yountville, which has expansive views of the hills; and a great pool I swam in when I was in Shanghai, which has an infinity edge—you could see the city’s skyline from the water. More locally, I love the new Sava Pool in San Francisco’s Sunset District—from an architectural standpoint, at least. For a competitive swimmer, the water’s too warm! What are your favorite pools, either competition or recreation? Hey Paul, Nice post. Hope all is going well. I have to say, I like any pool that has a swim up bar attached to it. Paul, the pools are terrific. Now, just have to find a piece of property to put one on!! !